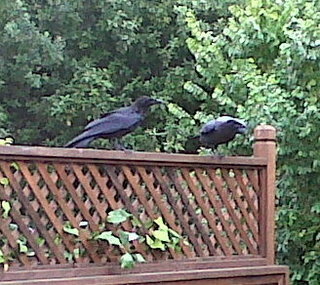 The crows in my neighborhood have been talking a lot lately. Flying back and forth from tree to tree, sharing their thoughts with each other and anyone who cares to listen. They like to stay up high, where they can look down on us and criticize our clothing and our hair. They are gossips. Mostly, I think they are talking about the fires all over the country. We just returned from a driving trip through Colorado and New Mexico, chased by smoke and fire, and 100 degree heat. On the plane, I sat next to a forester traveling to Colorado from Canada, who said that world temperatures have risen exponentially since the advent of the Industrial Revolution. It’s getting harder and harder to deny that humans are exacerbating climate trends already be in play. These trends might be natural, but we are now in the way, with our houses and cars, our sidewalks and parking lots. We think one tree, or two, or twenty in a neighborhood won’t make a difference, but each large tree absorbs 500 gallons of water a day that would otherwise run off into the ocean. The more we build on our soggy island, the more we dry it out. The more people we add, the fewer people we will be able to support. A few nights ago a storm of hail and lightning swept through the area. It was fierce and short. By morning, flames had consumed a restaurant on the island. The cause is not yet known. A huge cedar still stands untouched behind the remains of the building. “Fire! Fire!” the crows squawk. They don’t like it anymore than we do.